There are several components to the Montessori educational philosophy. These fundamental tenets make each classroom a special and inspiring place. Children at this stage are abstract rational thinkers. The classroom creates a community that enables collaborative work characteristic of the elementary child. Children are curious and active participants in their own learning. They often choose what their work is, where to do it, when to do it and with whom to do it. These choices develop independence and build confidence. Socialization is a key element of this plane and the classroom community provides a mini-society where children actively seek to find and create their place in the group. Children at this stage are in the transition from childhood to young adulthood. Significant physical growth, self-scrutiny, impatient expectations, lack of self-confidence (often disguised as bravado), desire to belong, desire to contribute to society, questioning of rules and the belief that their experience cannot be understood by others characterize this period. As an adolescent’s body is undergoing an amazing transformation, the adolescent’s mind and personality are changing radically as well. Their cognitive abilities improve in three major areas: thinking abstractly, thinking hypothetically and thinking about their own thought processes (meta-cognition). The primary task of an adolescent is to form a coherent sense of self. While humans undergo significant identity changes throughout childhood, it is not until adolescence that we have the capacity to recognize these changes in ourselves. Forming an identity facilitates our ability to take on adult roles in society; if we know ourselves, we are better able to make choices about careers, religion, politics, and personal relationships. Dr. Montessori stated, “Now is the time…when they should develop the noblest characteristics that would prepare a human to be social, that is to say, a sense of justice and a sense of personal dignity.” The development of these characteristics in a classroom, as well as in the urban environment beyond the classroom, is what NNM offers the 12-14 adolescent in the third plane of development. All of our classrooms are multi-age classrooms, usually with students ranging in three-year spans, structured around these four distinct planes of development. This allows each child an opportunity to experience being a newcomer and eventually a leader in the classroom community. Strong and meaningful relationships are built among students, teachers, and parents because children stay with the same teacher for three years. These relationships are crucial to providing the best education possible. The classroom is a community of learners who learn from one another and form enduring bonds. At NNM, we prepare our students for life by offering them a rigorous academic program that develops important skills for success such as creativity, communication, critical thinking, independence, confidence, and resilience. 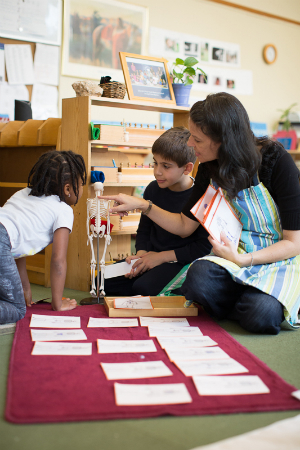 Dr. Montessori referred to this approach as “Educating the Whole Child,” that is, catering to each student’s academic, physical, emotional, spiritual, and moral development. Montessori’s developmental approach recognizes that each child reaches certain milestones at different stages. As such, the Montessori lessons are presented to students when they are developmentally ready and have mastered certain prerequisite activities. NNM created its Curriculum Scope and Sequence document to help our families understand the progression and duration of the Near North Montessori School curriculum. It is designed to demonstrate the continuum of knowledge from one developmental level to the next and to illustrate the depth of each subject area. The classroom teacher acts as a guide and facilitator, rather than as a traditional educator, and is continually assessing the progress of each student. The teacher provides lessons and guides the children in the pursuit of their interests and passions and spends most of the time working with small groups of students as the rest of the class works independently under the supervision of the teacher assistants. While we teach all of the traditional academic subjects, we pay special attention to the social and emotional needs of each child. Responsibility, independence, care of the community, and joy of learning are all valued qualities that the students learn in every classroom. Class performances, week-long trips, cultural field trips, Flex Fridays, and Sandwich Shoppe are further examples of the many opportunities in which students can learn and practice essential life-long skills. Observation of the student by the teacher is the cornerstone to effective assessment. Teachers make many formal and informal observations of each student throughout the day. These observations allow the teacher insight into the student’s work habits, academic progress, interests and social interactions. Teachers often use these observations as a basis for individual conferences with students where the teacher and student will work together to set goals. Montessori lessons are generally given to individual or small groups of students. This practice allows the teacher to ascertain quickly how much the child comprehends the concept presented. Instruction can be differentiated based on the needs of the small group or individual student. Repetition or increased instruction is implemented as needed. Primary level teachers informally guide the work of their students. Elementary level teachers conference with the student to discuss progress, completed work and future goals. The children also keep a work journal to record their school day activities. Communication between teacher, parent and child is essential to understanding the unique learning profile of each student. In seventh grade, students begin to receive grades and report cards detailing their progress. Students in seventh and eighth grade receive one mid-term report and one final report card each trimester. For the purpose of standardized testing, we recognize children by traditional grade level. Children in the second grade are screened for language and mathematics skills. Children in third through seventh grade take the “Measure of Academic Progress (MAP) test three times per academic year. The testing is used as another teaching tool for teachers and parents to direct instruction and allow children practice in taking standardized tests.